After all, each monthly report seems to show an economy creeping along, gaining or losing a few hundred thousand jobs per month — a tiny number compared to America’s massive 160-million-person labor force — painting a picture of a calm and stable job creation process. In reality, this view is far from the truth. The American labor market is a massive, churning system. Each month the economy creates millions of new jobs, and also destroys millions of old jobs. The difference between those two tumultuous forces is what shows up in the monthly jobs report: The net gain in jobs after all losses are accounted for. Let’s take a closer look at job creation and destruction in America, and what it means for the nation’s long-term prosperity. The best data on job creation and destruction come from a program called “Business Dynamics Statistics” at the U.S. Census Bureau. This is a longitudinal survey that tracks millions of American companies over time: their birth, expansion, contraction and death. These data provide a powerful window into the chaotic job creation processes at work underneath the high-level monthly jobs report. When new start-ups are founded or existing companies hire, the economy adds jobs. When older companies shrink or shut down, the economy destroys jobs. During good times, jobs created exceed the number destroyed and the monthly jobs report shows positive gains in nonfarm payrolls — the most closely watched number in the monthly jobs report. During recessions, the balance simply tips the other way. There are still many jobs created and destroyed during recessions. However, job destruction from failing business outpaces job gains from new and existing employers, pulling down net payrolls. Thus, in both good times and bad, the economy is constantly churning and both creating and destroying many more jobs than is apparent from the monthly jobs report. Today there are about 6.7 million locations or “establishments” that hire and fire American workers. This number churns pretty dramatically every year. Roughly 700,000 new locations are born each year — about 10 percent of the total — and about 580,000 workplaces are shut down every year. Today, about 13.3 million jobs are destroyed every year, or 1.1 million per month. By contrast, about 16 million new jobs are created every year, or 1.3 million per month (see figure below). The difference between jobs created and destroyed — around 200,000 per month — is the number of net jobs added to payrolls. That figure for net job creation corresponds to what we see in the monthly BLS jobs report. For example, the most recent report showed 151,000 new jobs were added to payrolls in August. But that’s only thenet gain. Beneath that figure, more than a million jobs were actually created by new and expanding companies, while just under a million were destroyed by shrinking and failing companies. Thankfully, job creation has outpaced job destruction in America for years. The end of September will mark 72 consecutive months of positive net gains to payrolls — the longest streak on record since the federal government began collecting data in the 1930s. That’s powerful testimony to the health and strength of today’s labor market. What sectors of the economy are creating and destroying the most jobs? Although the services sector of the economy has a reputation for stability — consulting, travel, technology and more — that industry creates and destroys the most jobs in the economy by far. 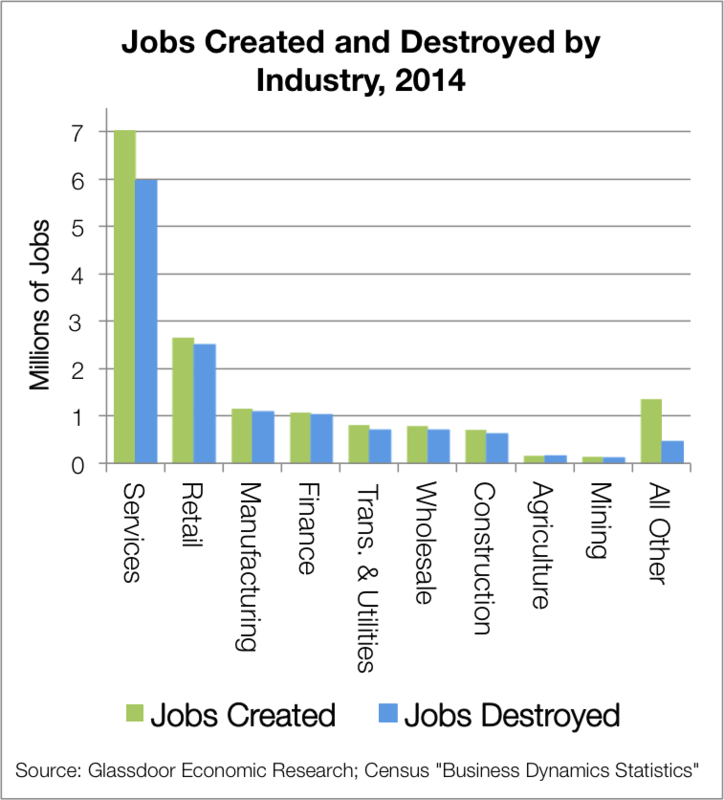 The figure below shows the number of jobs created and destroyed for the ten industries tracked by the Census Bureau as of 2014. During that year, the services sector created around 7 million jobs and destroyed about 6 million — a massive churning of employment due to growing and shrinking companies. Behind services, the volatile retail sector has the second largest churning of jobs in the economy, creating 2.7 million jobs and destroying 2.5 million. They are followed by manufacturing (1.2 million jobs created, 1 million jobs destroyed), finance (1.1 million jobs created, 1 million jobs destroyed) and transportation and utilities (820,000 jobs created, 690,000 jobs destroyed). Not surprisingly, the smallest overall job churning occurs in mining and agriculture, which today are two of the nation’s smallest industries in terms of total employment. Job churning — the massive creation and destruction of jobs observed every year — plays a vital role in the economy. Like a forest fire clearing away the underbrush, the roughly one million jobs destroyed in America every month clears the path for the expansion of newer, more productive roles at growing employers. Job creation and destruction are really two sides of the same coin. A healthy economy cannot have one without the other. 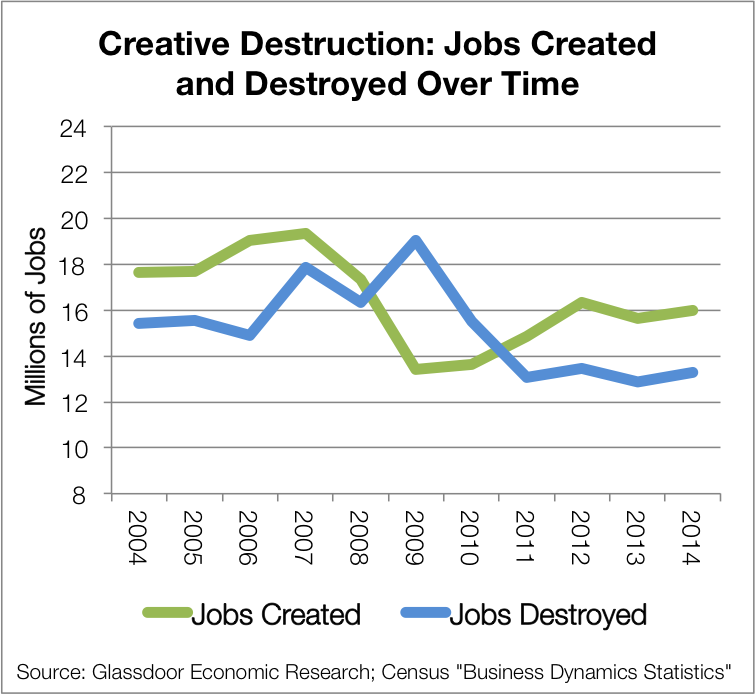 And this process of “creative destruction” is an important engine driving up U.S. living standards over time. The fuel that keeps this engine of job creation and destruction charging ahead is new business formation. Research shows start-ups make a disproportionate contribution to new job creation. And they also play an essential role in driving productivity gains in the economy by displacing older, less productive companies. Of the roughly 16 million jobs created in America each year, about a third come from new establishments — many of which are start-ups. However, a worrying trend in the United States is that the pace of start-up creation and business dynamism has been falling in recent decades. 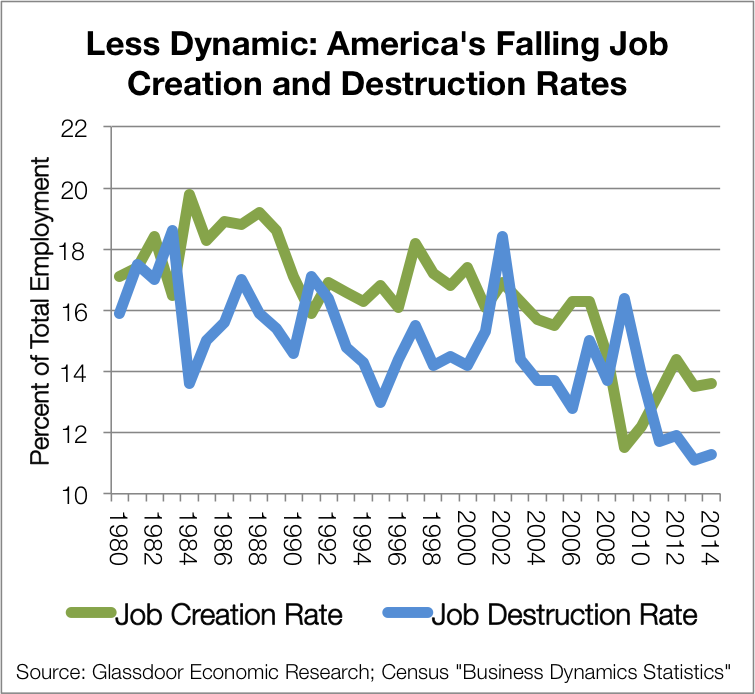 Since 1980 the pace of both job creation and job destruction has slowed markedly (see chart below). Despite today’s headlines about fast-growing Silicon Valley tech startups, the pace of job growth today from start-ups is actually well below past decades, and is down 25 percent since 1980. This is a worrying trend for the long-term health of the nation’s labor market. What will it take to boost America’s business dynamism back to previous levels? When elected, the next President will have to tackle this problem, although economists today still disagree about the causes and solutions for this dilemma. New business formation is one of the big drivers of worker productivity. And productivity is the biggest driver of wages in the long run. At the end of the day, workers can’t be paid more than the value of their hourly output for long. If policymakers can boost the pace of new jobs coming from start-ups in coming decades, we may finally witness a pick up in America’s stubbornly stagnant pace of wage growth — something every worker would like to see. (This article originally appeared at www.glassdoor.com/research/). These data are for 2014, the most recent year available from the U.S. Census Bureau’s “Business Dynamics Statistics” program. Source: http://www.census.gov/ces/dataproducts/bds/. These figures reflect total job creation and destruction by industry. Figures for the rate of job creation and destruction (that is, jobs added or lost as a percentage of total employment in that industry) are also available from the Census Bureau.